Saigon to Hanoi is a long distance to travel in three weeks, so I thought. We had traveled through Thailand and savored their curries and delicious fruit, biked through Laos meeting the friendliest people and visited the sights of Cambodia before heading to Vietnam. Travelers had warned us to watch out for scammers and insisted that we will feel like a walking ATM in their country. Specifically I had read an article by Nomadic Matt outlining why he would never return to Vietnam. Well, I wanted to prove Matt and everyone who told me that I wouldn’t love Vietnam wrong. We bought an open bus ticket traveling North from Saigon. After spending three weeks searching for good food, actively trying to avoid getting massively ripped off, and meeting new people (only to find out later that they were trying to sell us new clothes or the spa next door) we are officially exhausted. We have one blog post outlining our travels in the country and unfortunately it is not a very optimistic travel report. The food was hit or miss, and mostly miss, which was disappointing to us. We have great Vietnamese restaurants in Chicago and we longed to come to Vietnam and seek out delicious food stalls serving mouth watering pho. We avoided the restaurants serving both western and local food and headed straight to the stalls that usually don’t steer us wrong. The flavor was missing, the texture seemed off and despite an array of foods tried, nothing stuck in our memories like the Thai curries or Indonesian eats. I expect to pay more than the locals and have no problem with this. But, after watching the 10th local eat the same meal as us and get charged 1/2 the price of what we paid, it gets exhausting. A few dollars more is fine but double the price seems a bit much when you sitting on the same mini stool suffering the same hot sun to enjoy a bowl of pho, especially when you could get that price at a fancy hotel. It becomes exhausting when you have to negotiate for every piece of fruit you purchase on the street. Meeting the local vendors is one of the ways that we get to connect with new cities. 99% of the people we met were either outright rude after not spending enough money in their shop or quickly turned the conversation to a sales pitch for their sister’s spa or friend’s shoe store. We felt that we couldnt get past the “walking ATM” stereotype and were looked down upon for not emptying our wallets to every passerby. Halong bay was the only group tour that we did while in Vietnam, and even this we went back and forth over prior to booking. Would it be worth it? The reviews of Halong bay from fellow travelers range from breathtaking beauty to smelly trashpit. I have seen where natural beauty is quickly ruined by tourism and feared that this is what I would find when traveling to Halong Bay. Our trip wasn’t as deceiving or dirty as we had heard. We paid $70 each for 1 night, 2 days, not skimping by any means, but not splurging on the nicest boat. The food was plentiful and tastier than some of the food we had found on the street. Although crowded with boats and questionably clean water, the peacefulness of the bay during the late hours of the night and early hours in the morning was enjoyable. To be away from the unwelcoming atmosphere of Hanoi just for a night was enough to consider the trip a success. You want to believe that you are different. If you go into the shop or food stall with a different attitude the owner will see that you are a different type of “tourist” and consider putting down their guard for awhile and give you a chance in spite of your “American” culture. If your smile is sincere and your xin chào sounds authentic enough they might consider welcoming you in for more than just your money. Matt mentioned that he was “constantly hassled, overcharged, ripped off, and treated bad by the locals.” We didn’t leave Vietnam feeling miserable, just indifferent. No one person, or activity that we did is pulling us back. The food wasn’t anything to look forward to and the hassle of getting around was more than we preferred to go through for a simple taxi ride. I went to Vietnam challenging everything I heard, wanting so badly to fall in love with it. Many people I met asked me, “Why did you want to come to Vietnam?” not in a negative way, but genuinely curious. I realized after the 4th or 5th time I got the question that I had no idea why. I wanted to experience the culture and I simply wanted to taste the food of the regions. I wanted to meet the people and hear their thoughts and perspectives from a world away. Maybe we didn’t try hard enough. Maybe we were just unlucky enough to go to all the wrong restaurants, street stalls, and markets. We stayed on the beaten path. Maybe if we spoke Vietnamese it would have been different. I took home a fabulous dress from Hoi An and some really great sunrise photos from the beach, but overall Vietnam is not a country that I was able to immerse in, get to know and be inspired to return to. Along with Matt, I have no desire to add Vietnam to my future travel plans, unless an event required me to go back. And three weeks was too long for us. Usually we have enough flexibility to change our plans, but we bought a cheap non-refundable flight from Hanoi to Bangkok which kept us in the country about a week longer than necessary. Does this mean you shouldn’t visit Vietnam? Absolutely not. We thought about it after hearing story after story of bad experiences from other travelers. But there is no substitute for experiencing something yourself, which is why we travel. I’d much rather have the personal experience and dislike it, than spend the rest of my life talking about a place without ever knowing what it’s really like. If you are planning to visit Vietnam I would challenge you to prove me wrong, prove Matt wrong and let me know about it when you do. I want to share in your stories! What an experience! I’m glad you are still positive on your trip because Vietnam seems very exhausting country,especially after Laos where we met you. We went to Thailand for 3 weeks, and are now headed to South Africa. We’d love any South American tips you have! I agree with you on avoiding taxi’s. We generally avoided getting ripped off, it was more being overcharged again and again. Usually this isn’t a big deal, but it added up over time, and after 3 weeks of being chipped away at, we decided it just wasn’t for us. We did have many positive experiences too. We spent two hours practicing English with some university students in a park in Saigon, which we really enjoyed. I loved Vietnam, but I only ever went on weekend trips back when I was living in Singapore. I think three weeks straight might have exhausted me, but I definitely want to return and explore the country more. We actually did end up getting scammed in Saigon, but still the positives of the country I felt outweighed the negatives. It was definitely too long for us. Especially since we were stuck in Hanoi (our least favorite city) for 8 days due to our visa complications and non-refundable flight. Had we spent more time in Saigon, done a tour in Da lat, and even laid on the beach for more than a day in Nha Trang, it may have been different. Hey guys – Everyone has their own experiences, for sure… but I would NEVER write off Vietnam….. we were there for 5 weeks, and loved it! It was cheap.. we thought the people were friendly… the food was some of our favourite. 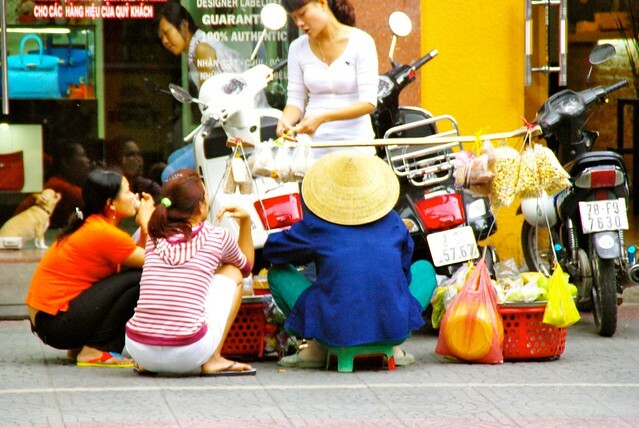 We spent a decent amount of time in Saigon, and really enjoy the city. Dalat was a beautiful mountain town. 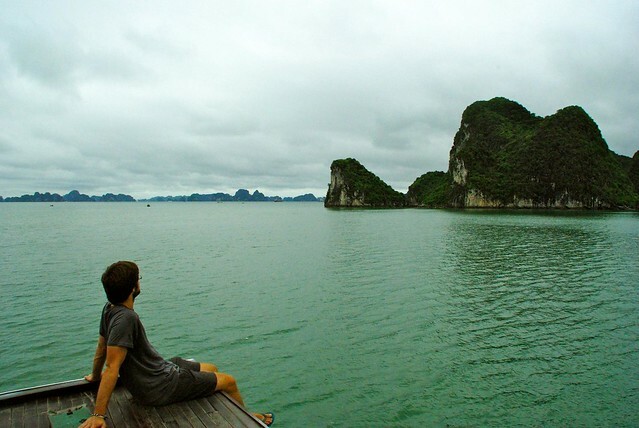 Halong Bay was outstanding, and we spoiled ourselves a little by going to Phu Quoc – ummmmm, paradise! We did an overnight train from Danang to Hanoi which was a cool experience, and we also did a Mekong Delta Homestay. It may have helped a little that my parents had come to visit us while we were there, so of course any place we met up was going to be special, but I would go back in a heartbeat (and in fact my wife actually did a month later when her sister came to visit). Sorry to hear about your unfortunate experiences, but to those reading… I would never forego Vietnam… we loved it! Hi Skott, thanks for your comment. I’m glad to hear you enjoyed Vietnam. That’s the great thing about travel. Everyone experiences it differently. If I came back from an around the world trip and said I absolutely loved every country I went to, I’d feel like I did something wrong. I’m glad we didn’t have the best experience, because otherwise this whole trip would feel surreal, and having an OK or negative experience brings it back into reality. Congrats also to you guys on a year of travel. I’m excited for us to reach the same milestone. Hope it may be helpful to some? If you didnt enjoy the food in VN, you were definitely doing something wrong! I agree – we love VN food… it was what we were most looking forward to. The food we ate was ok, but nothing was amazing – like we said i think we just sat down at the wrong restaurants! I’ve been living in Vietnam for the last two years. I hate to say it but, if anything the rap it gets is too nice. I have a Vietnamese female friend, who works as a translator. Everywhere we go, locals mutter that she is a whore. A friend of a friend who has travelled much of the world said that, without doubt, the Vietnamese are the nastiest people he has ever met. Greed and envy seem extremely prevalent. Women routinely complain that their husbands are very violent and that they relish beating them up. I am so over haggling over everything water, bananas, a donut! It get’s old really fast. I totally get it, been here 12 days another 13 to here! Hi. I have recently read the above article and comments. Shock!! My partner and I spent some weeks there in 2012 and are about to go back. We spent time in Ho Chi Minh, Hoi An, Hue, Da Nang, Hanoi and Haalong Bay. We found Hanoi the least friendly place but that was really because we saw an Aussie guy dragged off after sniping about the country while visiting Ho Chi Minh’s shrine. Whilst we were a little shocked, not surprised-silly thing to do.Haalong Bay was great and no issues-we eneded up having aparty in the crew’s quarters. Hoi An was slightly annoying with “my cousin, my friend’ recommendations etc, but we also had some amazing times. Also our food experiences were without exception great. For us, just mingling with the locals without expectations was great. Can’t wait to go back. I loved Hanoi. The city is pretty microscopic for a capitol city but it is very charming. YES though, I do agree with you that it gets boring fast having to negotiate for everything and I mean everything. Bottle of water, fruit, taxis, food. Basic stuff that in other countries, even poor countries like Cambodia, they don’t try to rip you off. Thank you so much for this post- we are in Vietnam at the moment, exhausted by the constant hassle and disillusioned by the scams and lack of respect. Thought it was just us, so good to hear your experience. Moving on to Laos next- can’t wait, and won’t be looking back!